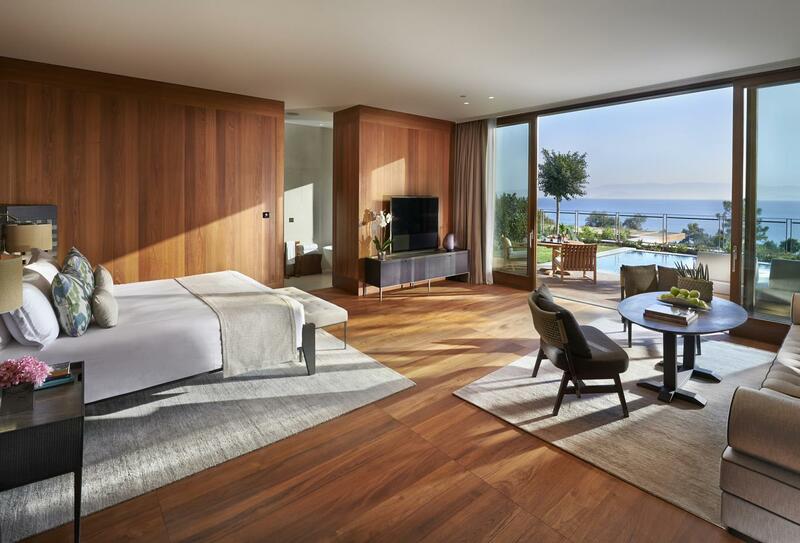 Set on a 60-hectare waterfront site on the northern coast of the Bodrum Peninsula, Mandarin Oriental, Bodrum offers two private beaches and views over the Aegean Sea. Guest rooms, suites and apartments are built on a series of levels in the resort’s landscaped hillside and each opens out to a balcony or terrace. Choose from nine restaurants, bars and lounges, as well as a cake shop with tasty treats. Cuisine ranges from Asian tapas-style dishes to delicious local specialities. At the resort you can relax by one of the pools or unwind with a holistic therapy at the 2,700sqm spa, enjoy a game of tennis on the court or head down to the water sports centre to go scuba diving. Nearby you can find the historical attractions of Bodrum Castle and Myndos Gate, as well as scenic hiking trails, pristine beaches and forests. These apartments consist of a living area, kitchenette, balcony or terrace and a marble bathroom. These rooms sit in a peaceful location within the centre of the resort and open out to an outdoor terrace with dining area and sunbeds. Interiors feature a neutral colour palette and custom-designed furnishings, including the choice of either a king size bed or twin beds as well as a comfortable sofa and large working desk. The modern bathroom features an over-sized bathtub, twin vanity units, handmade porcelain bowls and powerful walk-in showers. A one-bedroom apartment with views over the Aegean Sea. These apartments feature a living room, kitchenette and a balcony or terrace. These rooms feature a balcony or terrace, with a dining area and sea views. These apartments feature two bedrooms, a living room, kitchenette and a private balcony or terrace. These two-bedroom apartments feature a living room, small kitchenette and a private balcony or terrace. Offering views of Paradise Bay, these suites boast a large 35sqm balcony, living room and a bathroom with steam shower and bathtub. Open-plan suite with a terrace and private plunge pool. The interiors offer a dining and lounge space, as well as a bathroom with soaking bathtub and walk-in shower. A large and prestigious suite with a separate living area, spa treatment room, sauna, steam room and indoor Jacuzzi. The suite also has a 92sqm terrace and views of the Aegean Sea. Furnished with two bedrooms and a living room, these apartments offer panoramic sea views and a balcony or terrace. These three-bedroom apartments feature a private balcony or terrace, dining table and a small kitchenette. With four bedrooms, a dining table, fully equipped kitchen and a balcony or terrace. Expansive three-bedroom apartments with a choice of king or twin bed in all rooms. Enjoy a private balcony or terrace, a living room, dining table and kitchenette. Complete with three bedrooms, three bathrooms and a large lounge area. There is also a large balcony or terrace and sea views. Consisting of a living room, bathroom and kitchen inside and a terrace and swimming pool on the exterior, the Bougainvillea Suite overlooks the Aegean Sea. 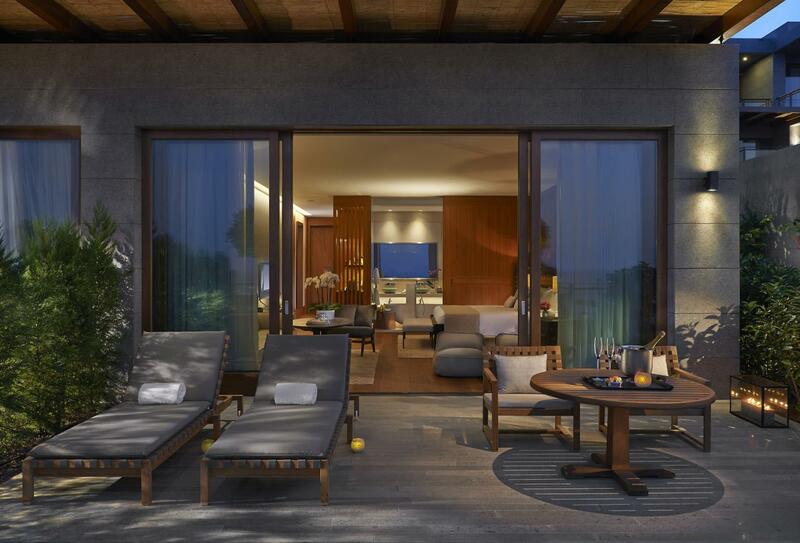 These suites have an expansive open-plan layout that houses a private pool, living area, kitchenette, bathroom and a terrace. Boasting a private pool and an outdoor terrace. These suites also feature a living room and sea views. These suites offer a large private pool and terrace. Inside, there is a kitchenette, living room, bathroom and spacious bedroom. Split over two floors, the Three Bedroom Duplex Apartment features two bedrooms, a lounge area, terrace, private pool and outdoor shower on the ground floor. The first floor is comprised of the third bedroom and a small sitting area. 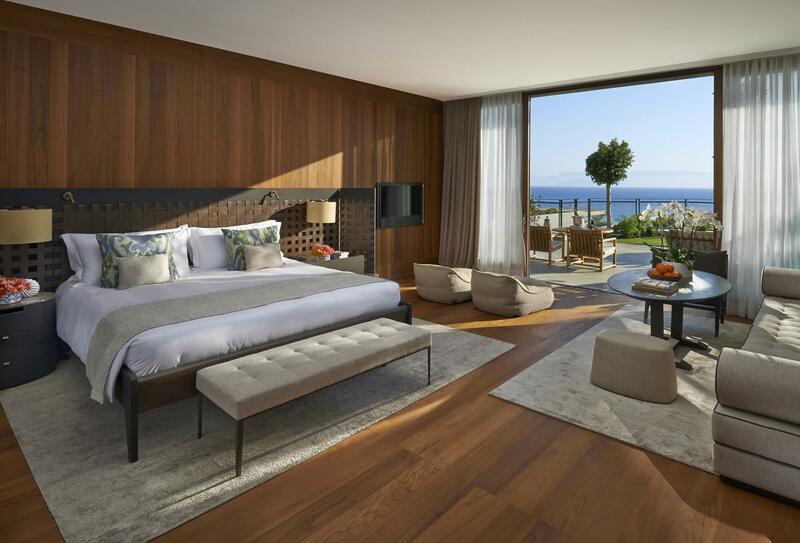 Spread over three floors with views of the Aegean Sea. Your spa journey begins with a consultation with your therapist. From here, discover the many unique treatments at the spa, as well as outdoor cabanas, hammams, private scrub rooms and indoor and outdoor swimming pools. Therapies include facials, massages and signature treatments. Italian style alfresco dining with a light menu using fresh, from simple salads to traditional wood-fired pizza. Open May to September, 19:00 – 23:00. Overlooking the Aegean Sea, this Turkish restaurant serves fresh, seasonal produce and local cuisine. The menu includes seafood appetisers, tapas style mezzes and grilled food. Open April to September 19:00 – 23:00. Influenced by Turkish culture and cuisine, Softa is an atmospheric restaurant with the choice of indoor or outdoor dining. Enjoy pastries, baked breads, fresh fruit and a range of special sweets for children. Open April to October for breakfast 07:00 – 11:00 and dinner 18:30 – 23:00. Modern Japanese cuisine offering a mix of appetisers and grill dishes. The restaurant overlooks the main beach and features an open kitchen. Enjoy a varied drinks menu consisting of local and international wines, cocktails and sake. 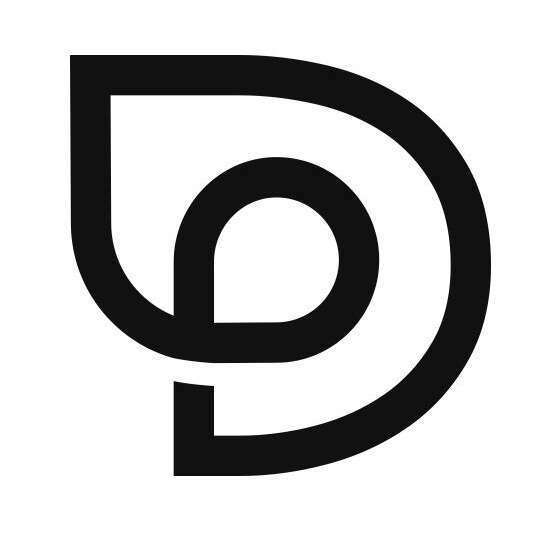 Open June to August 19:00 – 23:00. Offering an array of poolside favourites with fresh juices, homemade ice cream and a special children’s dining area. Open April to October for lunch 12:00 – 18:00. A beachside location with a private cabana and a menu of savoury snacks and sweet treats like ice cream. Open 10:00 – 18:00. A laid-back, sophisticated atmosphere with a menu consisting of mocktails, premium liquors, cognaxs and beers. Open April to October for cocktails 11:00 – midnight and snacks 12:00 – midnight. Serving pastry, freshly brewed coffee and carefully crafted breads, chocolates and cakes. Open April to October 10:00 – 22:00. 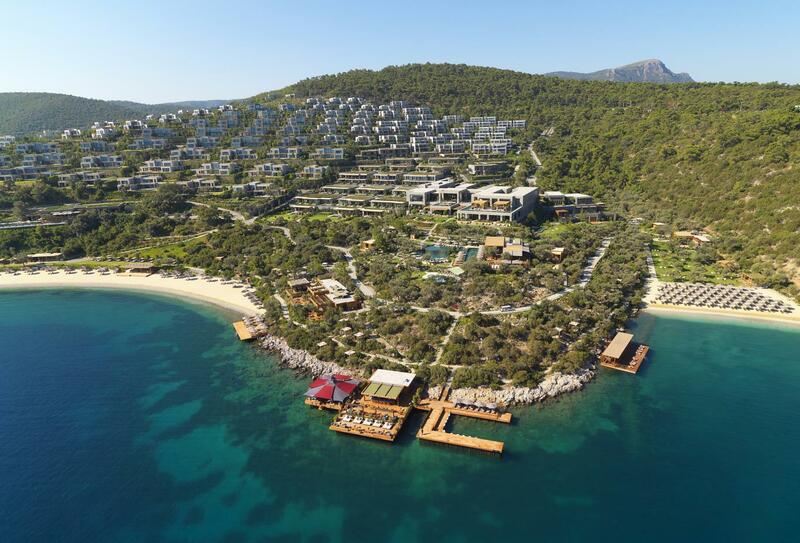 Mandarin Oriental Bodrum is located on the northern coast of the Bodrum Peninsula at Cennet Koyu (Paradise Bay), five minutes away from the waterfront town of Göltürkbükü. Milas-Bodrum International Airport is situated a 45-minute drive away. Mandarin Oriental Bodrum welcomes families with children of all ages and offers the following facilities and services to ensure they have an enjoyable stay.